You may already know this, but we go out. Sometimes, we even go out in Brooklyn (gasp!). We go where the fun is, and sometimes that is across the river. As the night winds down, your party flags down some cabs and heads back over the Manhattan Bridge towards home, you remember that there is some delicious late night food waiting for you nearby. 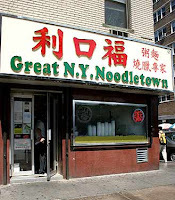 Great N.Y. Noodretown is already well known, but the proprietors have just taken things to the next level. Soft Shell Crabs are back. Fact. You stumble in, wait your turn for a table and order up a plate (or six) of the summer speciality. Even though the portions are smaller and more expensive than ever, NY Noodletown is the home of the best (and only) late night soft shells in town, China or other. The mix of salt and crispy crust make these buggers the perfect post bar food, at least until we wake up. They are only in season until late July, so get em while they're soft. mmmmm mmmm! ruv them soft sherrs! Finally, a Nightclub for Hippies? Is Stephen Starr For Sale?